The Law Offices of William C. Makler, P.C. regularly and effectively assists former and new clients with criminal record clean-up. There are a variety of ways through which you MAY be able to reduce the negative effects of many arrests, criminal convictions and juvenile adjudications. Among the clean up remedies is the remedy commonly known as expungement. Other remedies include the reduction of a felony to a misdemeanor, plea withdrawal, prop 47 re-sentencings, prop 64 (marijuana) resentencing/redesignation/dismissal, pardons, and the sealing of a juvenile record. Arrests can be rendered detentions by way of the subsequent failure by authorities to pursue charges. In those instances, the arresting agency is required by law to issue a “certificate of detention only” and to see to it that the word “arrest” is purged from any records of the incident. Additionally, some arrest records may be “sealed and destroyed” by way of a remedy known as a “finding of factual innocence”. Yet another remedy, new in 2018, is a petition to seal law enforcement and court records of any arrest or referral for prosecution that never resulted in a conviction. Each of these remedies function differently and may or may not be a applicable to the conviction, arrest, or adjudication at hand, depending on timing, what class of crime, the relative strength of the evidence and many other factors. Moreover, it is important to recognize that none of these remedies function like a “time machine” to enable you to go back in history and undo something which, fundamentally, cannot be undone. However, these remedies can very often allow you to move ahead with your life (e.g., career plans) without being unduly haunted a past mistake or mishap. To find out more about what, if any, of these remedies you may be eligible for, you may call us now at (805) 892-4922 for a free, no obligation, consultation. Or, if you prefer it, you may fill in your contact information and a description of what criminal legal problem you may need help with in the contact form to the right and we will get in touch with you as soon as possible… frequently within a few minutes. 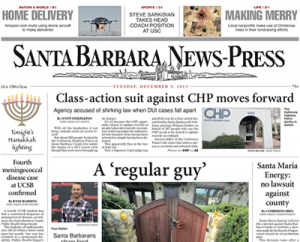 Bill Makler was recently featured in the Santa Barbara News-Press for his work in forcing the CHP to follow their statutory obligations to “clear” the records of people who they arrested but where prosecution was declined.